My turtle conservation blog gave a very positive side to the turtle conservation at Tortugario zoo in Cuyutlan Mexico and so it is! However things are not always as they seem. A more difficult side has surfaced over the last week. In the original blog I mentioned that egg poaching is a problem but unfortunately at this time of year proportionately it is greater than we imagined. This really came to our attention after a couple of recent night patrols looking for nests, and a nest cleaning exercise at Tortugario. I was out 2 nights ago on the quad and we luckily found 5 nests and recovered the eggs, however as we recovered eggs from one laying female we saw lights moving up and down the beach maybe 1km from our position. I watched for a while and Javier mentioned it was probably poachers. Sure enough we found 2 nests which had already been raided. We dug down at each and found nothing. The following night Isabella another of the volunteers was out on patrol and found 4 complete nests but she also found 4 empty nests. The score 9 – 6, not a great ratio. So that was the nest raiding on the beach, now for nest raiding at Tortugario. Just to recap regarding the nest cleaning. 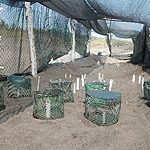 Eggs found on a night patrol are taken to Tortugario the next morning and re-buried in a nesting area specifically designed for this purpose. Each nest is marked and monitored for hatchlings. 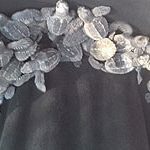 Once hatchlings have appeared (or in some cases not), then the nests must be cleaned. 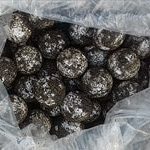 As mentioned in the recent bright blog the percentage of viable eggs may be 60% – 80% so many remain underground rotting and must be removed before another nest can be dug. Last week when we carried out the nest cleaning, 3 were completely empty suggesting poachers had broken into the area and removed the eggs. Working with Javier to dig out a nest to collect the eggs to take to Tortugario. The nesting area at Tortugario. Yesterday five out of seven were empty and we had no hatchlings to release to the sea. I left Tortugario feeling very angry, mainly because so much effort has gone into the collection and preservation of the eggs by all the volunteers and the team from Volunteers Abroad, then in one quick raid by poachers much of that effort had gone to waste. Later we sat discussing the situation and how could the nesting site be made more secure. As usual everything comes down to money. There is no lack of passion from anyone helping here or any of the staff at Tortugario but the lack of money means there is no security in place to protect the nests. Rather that becoming too judgemental we must now look at several factors which cause and influence the problem. These come into play as this is a very poor area and people need to make money to live. For some, stealing eggs and selling them is the best option. What a crazy value to put on the head of a priceless animal, especially one that has to fight so hard just to reach the sea, then avoid so many dangers over a couple of decades to reach maturity and finally to breed and produce offspring. 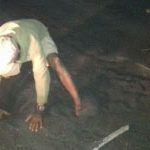 Note: during the high season, the volunteers may find up to 115 nests in one night and transfer maybe 10,000 eggs to Tortugario, in these circumstances the poachers will find sufficient nests on the beach to leave those at Tortugario alone. The glut of eggs also means the price per egg drops to around 4p. a) Tourists may buy them just for the experience. b) Locals may eat them because old wives tales say they are good for a whole range of ailments. c) Locals may eat them as part of their culture – even though they know it is wrong. d) Some people eat them because they believe the eggs act as an aphrodisiac. It will take a lot of education to remove any of these problems but thankfully there are a great many people putting effort into this goal. Ecotourism has been very effective in many parts of the world, when a live animal becomes more valuable to a community than a dead one. If money from people visiting the area filters down to the local community and reduces the need to poach then it can be happy days for everyone. This could be possible when the turtles arrive back on a Cuyutlan beach, but it does not overcome the ‘Tragedy of the Ocean Commons’ i.e. when a species such as a turtle travels widely in international regions of our planet there is a contested perception of ownership and regulation of human activity has proven to be difficult. Made it! 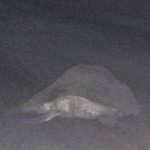 This Olive Ridley turtle has successfully laid her eggs and now returns to the ocean. Some of the priceless eggs.